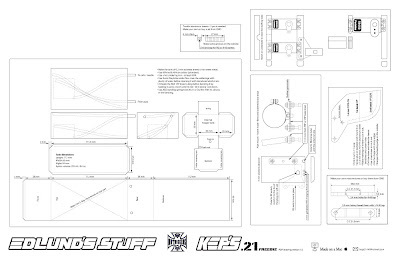 NE-Stuff: Kep's 21 Freebie PDF drawing! Update November 2012: The all new KEP's T2-21 is published - click HERE. The T2 is a more modern, lighter and faster 3.5 cc outrigger hydroplane! Update (October 2012): I'm happy to announce that Friday November 2 2012 I will publish a completely new PDF template freebie design - the KEP's T2 .21. So welcome back soon and download the next generation racing outrigger hydroplane freebie! UPDATE MAY 2010: The pdf's for this earlier "old" freebie is now removed - I have updated the design to 2010-spec now. The basic info here below is still valid though regarding hardware and material list etc. Click HERE for the Kep's .21 RACE2010 drawings. Update November 30: New V1.09 version. 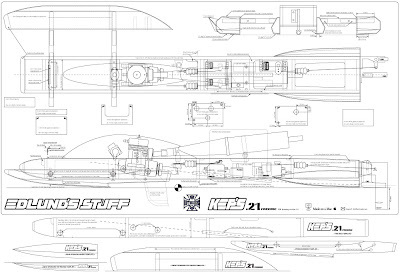 I have had this idea for a while now, to make a freebie template-drawing of my Kep's 21 racing outrigger hydroplane. So here it is. Download booth pdf's and go to an print shop and print them out on a full size drawing paper in 100% size. Then cut off the lower part of the main drawing and use them when you make your actual templates. See also the other links to the right for pics and tips on building wooden hydroplane riggers in general. They should include most info of how to build one of these. • Use a CMD drive line, including flex, strut, rudder etc. Update December 3: The PDF's are updated to V1.01 now. Cooling tube views are also included. Oops. Update December 4: I have uploaded an additional main Kep's 21 drawing if you want to see how it looks when U use an engine with 180 deg exhaust also. Use the the other main PDF for the templates etc. - K&S #1145 (old #145) 1/8" brass tube for tank & cooling water through the radio room (3ft). For the tank you need to anheal it to make the bends. - 8 mm solid carbon rods for where you bolt the sponson tubes in the hull, 100 mm long (2). You can use some hardwood dowels also, even make some nice ones in aluminum. - Center-pointed wood drill bits. 6, 10 & 11 mm. - Aquacraft 44x66L propeller #AQUB9765 - if you have never run a hydro before this is a good prop. If you have a high performance motor (low squish with 60% nitro) it doesnt load the engine enough so the motor doesnt perform its best. Its very easy when launching etc. Very similar to a stock ABC H4 prop. - Aquacraft 45x68L propeller #AQUB9768 - works good as it is for breaking in the engine or the first time you run the boat. No additional cup is needed to start with. Very similar to a stock ABC H5 prop. - Octura 1445 with 3.2-3.6 cup. Prepared either by either Mark Sholund (Props 4 you) or Andy Brown (CMD). - ABC H6 with 3.4-3.6 cup. Haven't tested these yet myself though. - 5-cell AAA receiver pack assembled in 3+2 configuration. - ZAP-A-Gap CA glue (green label) 1 oz bottles (2 or 3). You can use other brands also but thats what I use. - CA kicker. I use Great Planes #GPMR6034 but you can use your favorite brand. - 5 min epoxy. For small things like gluing in the tubes for the rubber bellows in the bulkheads etc. - Z-Poxy Finishing Resin #PT40. For impregnating all wood surfaces before painting. - Sikkens Autoclear Plus HS 2K clear and matching hardener + thinner is what I use. I use also spraycan white basecoat and 1K House of Kolor fluo paint that I apply with an airgun. - You must use a really good 2-component (2K) paint or clear coat system that can withstand the high-nitro content in the fuel.